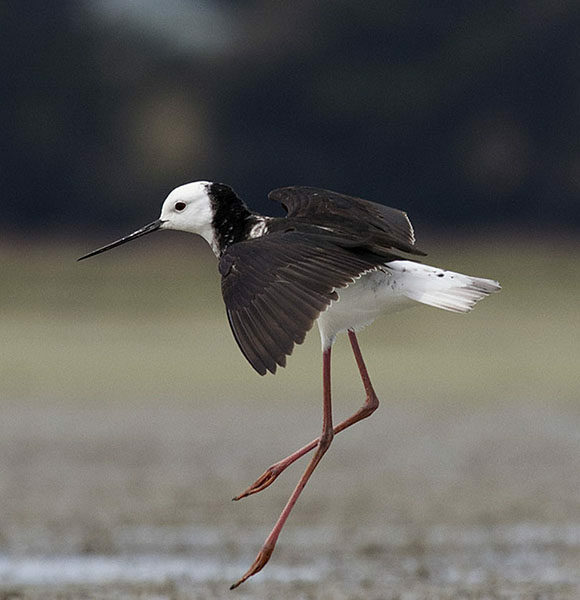 The pied-stilt-poaka is a small compact black-and-white stilt measuring 35cm and weighing around 190gm. The body is mainly white with black back and wings, and black on the back of the head and neck. In flight the white body and black on the back of the neck are conspicuous. The underside of the wings is black. It has long red legs and a long fine pointed black bill. 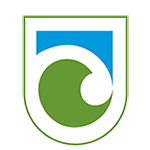 It is not endemic to New Zealand, however it is naturalised. 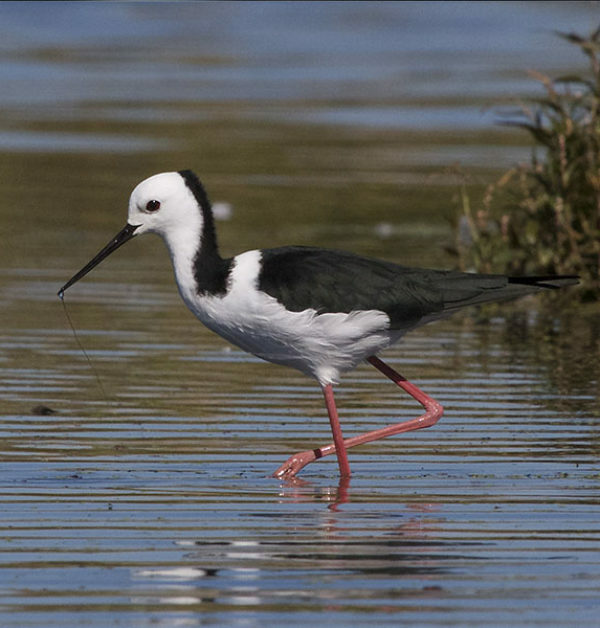 Believed to have arrived in New Zealand in the early 1800s, it is often seen with other wading birds, particularly the critically endangered black stilt-kakī and also oyster-catchers. Poaka can readily breed with the critically endangered kakī, which has led to a hybrid population. Adult hybrids have a black band of variable width across the breast. This can sometimes lead them to be mistaken for juvenile kakī. Unlike kakī, poaka are able to breed successfully in the presence of the same suite of predatory mammals, due in part to their choice of nesting site and anti-predatory behaviour. Their call is distinctive; they yap like a small dog. Poaka spend winter in lowland areas start moving towards their breeding sites along braided rivers in June-July each year. Birds wintering in inland areas start later, in August-October. Occasionally a single pair will nest alone, but usually they are in loose colonies of 3-20 pairs (Heather and Robinson, 1996). 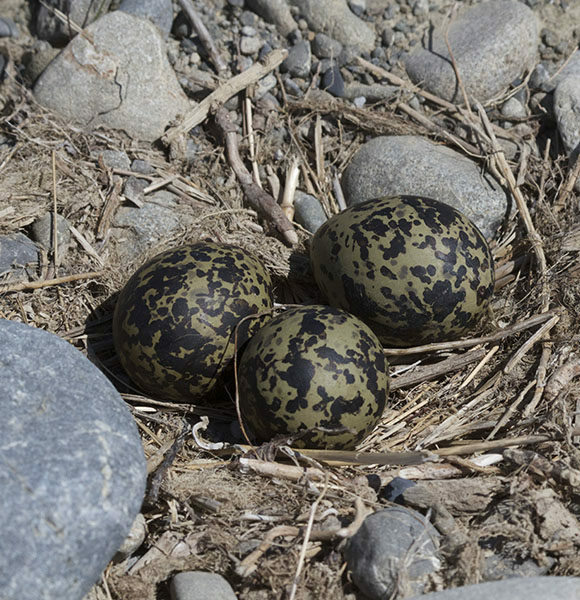 Both parents build the nest on the ground near water and incubate the 3-4 eggs, which hatch after c.25 days. The chicks leave the nest when dry, and can fly when 28-32 days old. When hatched they are brooded by their parents but find their own food. The parents continue to care for the young, which remain with them even during the end of season migration.